The Sea Vixen did not take part in any true wars during its career with the Fleet Air Arm though it took part in many operations. In 1961, President Abdul Karim Kassem of Iraq threatened to annex the neighbouring oil-rich state of Kuwait. In response to Kuwait's appeal for external help, the United Kingdom dispatched a number of ships to the region, including two fleet carriers. Sea Vixens aboard the fleet carriers flew patrols in the region, and Kassem's aggressive actions wilted in the face of the strong naval presence, thus averting a Gulf War over Kuwait. In January 1964, trouble flared in the East African state of Tanganyika after the 1st and 2nd Tanganyika Rifles mutinied against the British officers and NCOs who, despite Tanganyika being independent, still commanded the regiment. The mutineers also seized the British High Commissioner and the airport at the capital Dar-es-Salaam. The UK responded by sending the light fleet carrier HMS Centaur, accompanied by 45 Commando, Royal Marines. The Sea Vixens, flying off Centaur, performed a number of duties including the providing of cover for the Royal Marines who were landed in Tanganyika by helicopters. The operation "to restore Tanganyika to stability" ended in success. That same year, Sea Vixens of HMS Centaur saw service once again in the Persian Gulf, including the launch of air-strikes against rebel forces, this time supporting British forces fighting against locals disgruntled by the loss of tolls in the Radfan. Later in 1964, HMS Centaur's 892 Squadron Sea Vixens stationed off Indonesia, helped to prevent an escalation of President Sukarno's Indonesia–Malaysia confrontation. Sea Vixens saw further service during the 1960s, performing duties on Beira Patrol, a Royal Navy operation designed to prevent oil reaching landlocked Rhodesia via the then Portuguese colony of Mozambique. The Sea Vixen also saw service in the Far East. In 1967, once again in the Persian Gulf, Sea Vixens helped cover the withdrawal from Aden. There were a number of Royal Navy warships involved, including the carriers HMS Albion, Bulwark and Eagle (carrying the Sea Vixens) and the LPD (Landing Platform Dock) HMS Fearless. A small number of Sea Vixens were sent to FR Aviation at Tarrant Rushton airfield for conversion to D.3 drone standard, with some undergoing testing at RAF Llanbedr before the drone programme was abandoned. Among them was XP924, now G-CVIX, the only Sea Vixen to remain in flying condition, which has now been returned to 899 NAS colours. Owned and operated by De Havilland Aviation, G-CVIX can be viewed at their hangar at Bournemouth Airport in Dorset, southern England, or at air shows around the UK. Many other Sea Vixens remain in good condition but do not fly. This kit from Cyber-hobby Is pretty much the FAW.1 kit with additional parts to portray the tail booms extending forward of the wing's leading edge. These booms held additional fuel and to many, changed the look of the aircraft. 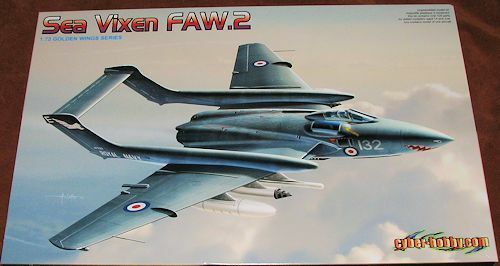 This is not, of course, the first Sea Vixen done in 1/72 with Frog doing one many years ago and somewhat more recently, XtraKit doing a version that was tooled by MPM. There were possibly others who reboxed these, but I do not recall any other new tool kits. Though I may be repeating what is below in the PR info, the first thing that caught my eye were the tail booms. I had originally thought that they had forgotten to include one of the boom halves, but it seems that Cyber-hobby has used their slide mold technology to make these a single piece. Very clever. Both the pilot and navigator positions are well appointed for the scale with reasonably well done bang seats. This will need weight in the separate nose cone though the instructions are moot as to how much. There is also a two piece windscreen/canopy to see what little is visible in the cockpits. Nicely long intake trunking is provided and the 'grille' that is so typical on many British jets is a separate piece, which is quite refreshing. Other neat options are for folding wings, deployed speed break and deployed flaps. Ailerons and rudders are separate pieces as well, adding to the 115 part count. For things to dangle under the wings you have missiles, fuel tanks and rocket pods. A new sprue is provided which, as on the real aircraft, basically goes atop the forward part of the existing tail booms. The FAW.2 flew with quite a few units during its life and Cyber-hobby has included markings for five of them. This includes 766, 890, 892, 893 and 899 Squadrons with two different markings for 899. All were extra dark sea grey over white, though most will want to use just dark sea grey for the upper color as the EDSG faded quickly when exposed to ultraviolet light. 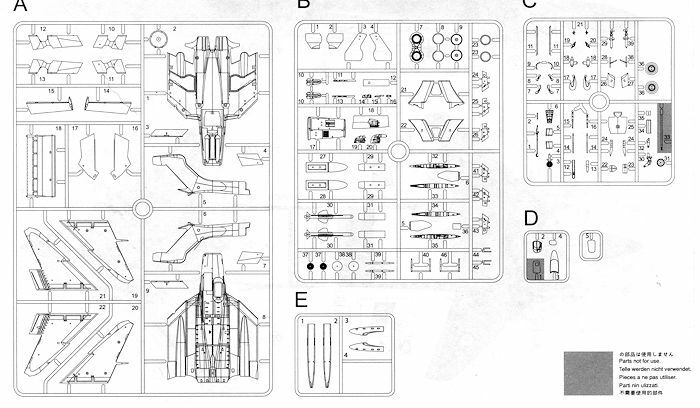 The two decal sheets include all of the myriad of data stencils carried on this aircraft. The decals themselves are printed by Cartograf, who seem to be expanding their reach and for good reason as they are excellent. Now I do realize that this may not be the subject for everyone, but for those of us who really like these somewhat unique looking British naval aircraft, it is a delight to have this one finally available. I very much enjoyed building the FAW.1 and expect this to be just as nice. Thanks to www.dragonmodelsusa.com for the preview kit. Get yours today at your local shop or have them order it for you. If you would like your product reviewed fairly and fairly quickly, please contact me or see other details in the Note to Contributors.